ACTAtek SmartTime, a full featured enterprise level Time and Attendance software incorporating labor cost management and job rostering facilities in one solution. SmartTime Management Decision Support tool allows businesses to plan and implement their workforce more effectively and efficiently. 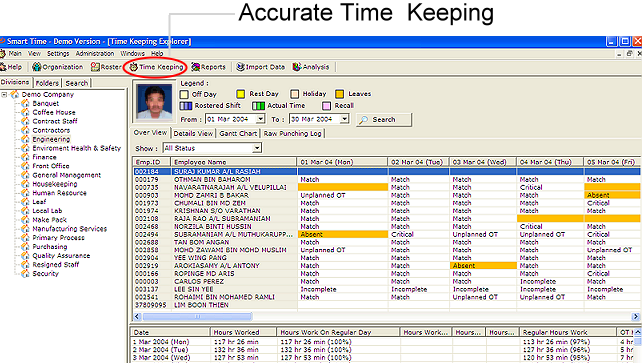 Comprehensive Time Attendance reports and detailed summary. ACTAtek SmartTime application had been developed to help achieve the full potential of your business with easy to use rostering facilities and accurate time keeping for smart real-time report analysis. ACTAtek Smart Time’s Management Decision Support tool allows businesses to plan and implement their workforce more effectively and efficiently. SmartTime delivers the tools that allow managers to reduce administration costs, run multiple projects on schedule and within budget while at the same time increasing work productivity. ACTAtek believes that the key components of all Labor Force Management such as Personnel Details, Roster Scheduling, Time & Attendance and Payroll should be a straightforward process that deserves a simplified software solution that offers unparalleled features, performance and value. Consider the switch to ACTAtek SmartTime and see how your business can benefit from our smart solution for Enterprise level labor management. "One Click" roster generator makes it easy to define jobs and classes. Real time reporting for accurate daily analysis. Suite of reports to generate including Time Card Reports, Trend Reports etc. Tightly integrates with the ACTAtek platform for maximum compatibility.